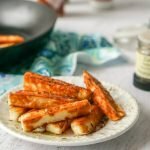 These za'atar halloumi cheese fries are a delicious low carb snack. Salty, briny halloumi cheese is simply pan fried and seasoned the bit of Middle Eastern za'atar spice. Only a few minutes to make, you will be crazy for this fried cheese snack. Spray a frying pan with cooking spray and turn up the heat to medium high. When the pan is hot, add the sliced halloumi fries and brown each side for 1 -2 minutes until browned. When browned on all sides, sprinkle the fries with the za'atar spice and eat immediately.